We all love our dogs and want the best for them. On this page you will find dog food recipes you can make for "Man's (and woman's) best friend" to show them you love them. Dogs have been eating table scraps for years. Now all of a sudden, it is bad for them? What? Homemade dog food is probably the best dog food there is. Sure, it takes a little time, but most of us cook anyway. Why not throw on a pot for the dog? And of course items like coffee grounds, tea, and alcohol should be kept away from your dog. Let's face it, they don't make good dog food! 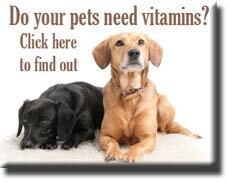 For more information, please see the ASPCA's Animal Poison Control Center website. Brown lamb in a fry pan. Boil water, put about 4-5 cups into a crock pot, so it is already hot while you are fixing the rest of the ingredients. Add cubed potatoes to the fry pan. Cut broccoli and add this to the crock. Put the rest of the works in the pot, add enough hot water to cover. Add pepper to taste. Throw in 1/2 cup brown rice and mix. We hope your best friend enjoys this tasty dog food recipe! Dissolve bouillon cubes in hot water. Add milk and drippings and beat. In a separate bowl, mix flour and oatmeal. Pour liquid ingredients into dry ingredients and mix well. Press onto an un-greased cookie sheet and cut into shapes desired. Bake at 300 for 1 hour. Turn off heat and leave in the oven to harden. Refrigerate after baking. Boil chicken breast for about 1/2 an hour, remove to cool. Add flour to chicken water. Beat out lumps. Add pre-beaten eggs. Cook on low heat until it's done thickening. Pulverize chicken in food processor. Add to flour/egg gravy. May need to add more water. Unfortunately it won't freeze. 1 lb meat - ground beef, ground turkey, ground venison, etc. Pulverize veggies, either in a blender, processor, grinder, etc. Mix all ingredients together in a big pot. Add enough water to cover, mix well. Cover the pot and simmer for about 2 hrs, stirring occasionally. When it is done cooking, cool, and place into containers or baggies, enough for one feeding in each and freeze. Simply get out in the morning to thaw in the fridge. Well, there you have it. Some great holistic dog food recipes. You get the idea. 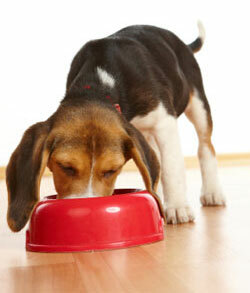 Just keep to the food pyramid - even for your dog, whole grains, meat and vegetables! They don't need all the sugars and fats that people are used to. They will think your food is delicious and will appreciate your efforts! They don't have nearly the number of taste buds that humans do, so if it smells great and is good for them, they will love it! Happy Cooking! Click to return Home from "Dog Food Recipes"